At 6 AM on Sunday, March 10, representatives from the Icla da Silva Foundation were at the Calle Ocho Music Festival in Miami, Florida. For the team members who attended, it had nothing to do with music. 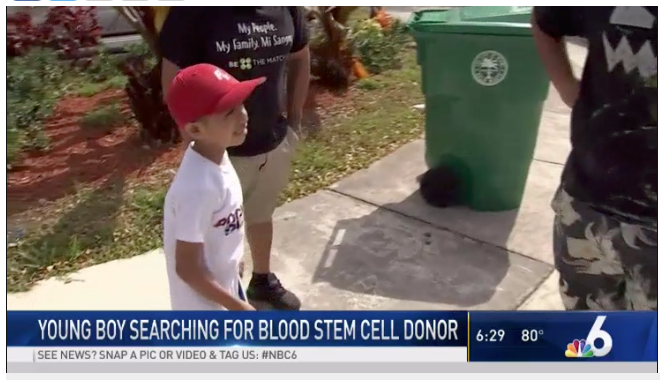 It was all about supporting the family of Julian Morales, with the hope of finding a matching stem cell donor in order to save his life. It was about Saving Julian. It was about setting up tables and organizing volunteers so that more people understood the need to join the Be The Match bone marrow registry. It was about eliminating the fear of joining and explaining the fact that only 7% of people on the registry are Hispanic. This is why patients with a Hispanic or Latino background have a more difficult time finding a match. There aren’t enough potential donors on the registry. 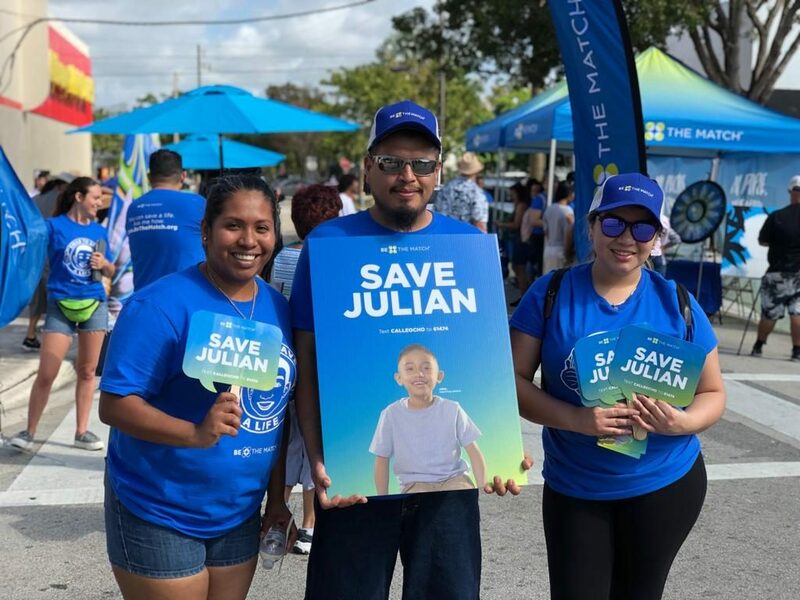 Being at Calle Ocho was about doing everything we can to give Julian a 2nd chance at life. It was about adding more potential life-savers to the registry. Julian suffers from a rare, life-threatening blood disorder called Dyskeratosis Congenita and bone marrow failure. He has been suffering for 4 years. Since there is no match in Julian’s family, they need to find a donor who is not related. They have been searching for a match for 4 years. There is still no match for him on the Be The Match registry. For the Icla da Silva Foundation, this past Sunday was about not giving up. We can listen to music later. 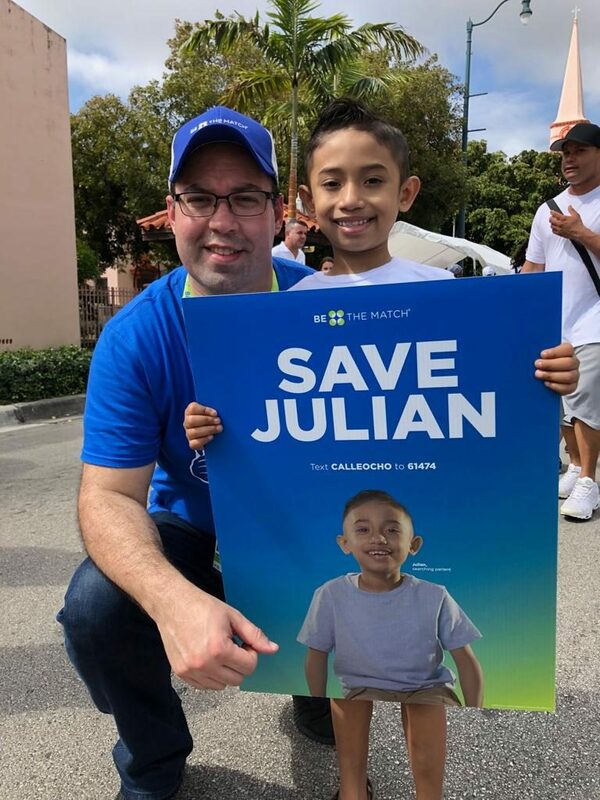 Right now we need to find a matching donor for Julian. You can join the registry by clicking the link. You will receive a kit in the mail which is used to swab the inside of your cheek. When you return that kit to Be The Match, they will test your HLA type to see if you are a potential match. You or someone you know may be a match for Julian. Please join and share with others. Renata Coimbra is full of life. She is always smiling and spreads joy wherever she goes. She is very close with her family and friends, she worries about those less fortunate, and she regularly contributes to her church and her community. She is recently married, a positive role model, and faithfully leads others in prayer. Renata was recently diagnosed with leukemia and is in desperate need of a bone marrow donor. 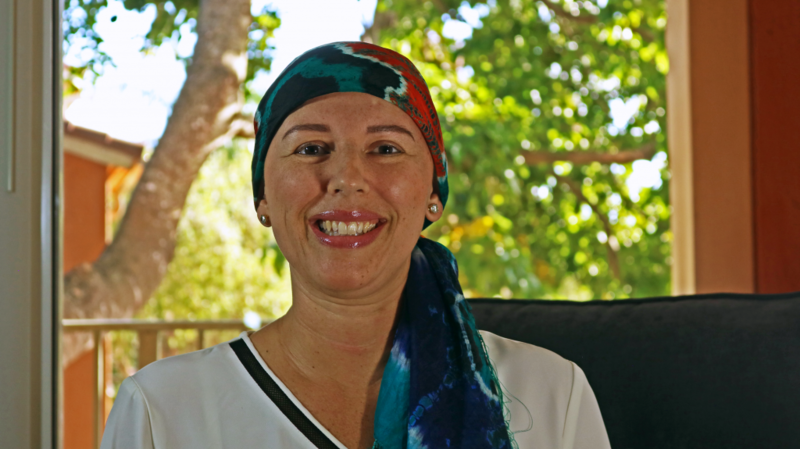 She has begun an aggressive treatment of chemotherapy and she knows that she has a long and difficult path ahead, but she has faith that she will find a matching donor. In 2001, she moved from Espirito Santo in southern Brazil, to Boston, Massachusetts, where she worked as a house manager and loving nanny for 13 years. Missing the tropical climate of her childhood, Renata moved to Florida in 2014, where she met and married her love, Danilo. Together, they enjoy music and movies, regularly attend church, and spend time with Danilo’s family, who has accepted her as their own. Late last year, Renata was suffering from shortness of breath. After multiple visits with doctors and specialists, she was unexpectedly diagnosed with a lymphoma that had formed in her chest and attacked the bone marrow. It quickly developed into leukemia. She has been told that even with chemo treatments to fight the cancer in her blood, a bone marrow transplant will be necessary to ensure her survival. After multiple treatments and two hospitalizations in the short timespan since she has been diagnosed, she has been forced to quit her job and live a remarkably different lifestyle. Before she got sick, Renata and Danilo enjoyed dancing and going to the beach on weekends. Although she misses work and her Zumba class, she has never lost faith that she will overcome this disease. Renata’s faith is overwhelming. Early in the search, they found three matching donors. Unfortunately, none of them were ready to make the commitment to donate. Renata insists that she has the support of God, friends and family, and a matching donor will come through. While we certainly hope that everyone who registers is able to stay committed if they ever receive the call, it is important to recognize that the vast majority of bone marrow patients require a non-surgical process called peripheral blood stem cell donation (PBSC). A PBSC bone marrow transplant requires a donor to take injections of filgrastim over the course of 5 days, which increases the number of blood forming cells in your blood stream. On the day of donation, your blood is removed through a needle in one arm, passed into a machine that separates the blood forming cells that your body has produced, and then your blood is returned back into your body through the other arm. The process is relatively simple. Please consider registering to become a potential bone marrow donor for Renata and the many other patients who are looking for a match. We share Renata’s faith that more people will register and stay committed.